I occasionally receive a fishing book that really strikes my fancy as being totally original, and last winter I was lucky enough to get an advance copy of The Feather Thief, by Kirk Wallace Johnson. Much more than a fishing book, it’s the story of a young Atlantic salmon fly tier who stole priceless bird skins from a British museum and then used them for his own tying and sold them on the internet. Kirk researched the story thoroughly and even tried to trace some of the feathers that were purchased to get them back to the museum. The book reads like a whodunnit, and I found it fascinating reading. To use a well-worn cliché, I could not put it down. Some of you fly tiers may be not agree with the stance he takes on tiers obsessing over rare and unusual materials, so I think it may create some lively discussions. Regardless, I think you’ll find our discussion fascinating. Why do two dry flies work better than one? How do you fish a Sneaky Pete for smallmouths in fast water? What size and color Woolly Bugger is best? What does the Woolly Bugger imitate? What color polarized sunglasses are best and what are some good brands? Why can I land 18-inch fish but not the ones that are over 24 inches? Is it normal to tie a Clouser Minnow with a red head? Is it normal to reel all of your line in before playing a fish? Why am I not catching bigger brook trout on streamers? 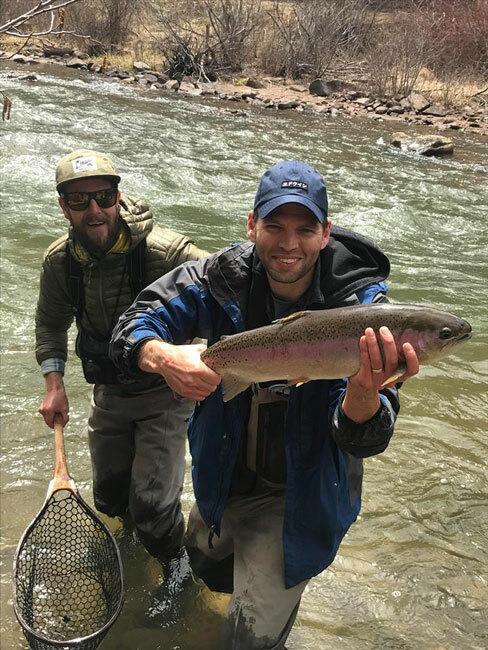 Kirk Johnson took time off from his book tour to catch this South Platte rainbow. Hi Phil, you have last week’s podcast loaded here. Yeah, I’m not very bright sometimes. Thanks. Fixed! This is an outstanding presentation with Kirk W. Johnson. The conservation message is outstanding as is the scientific connection.